We were asked to be the creative guest chefs on www.domessticated.com awhile back and made these cute little piggy pot pies. We wanted to also share them here. 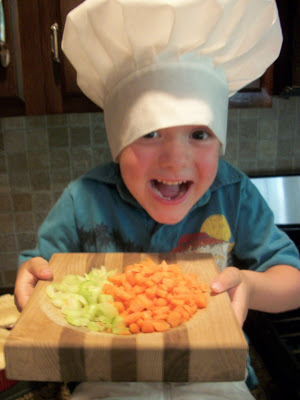 This is such a fun way to get the kids to eat their veggies! We combined a few pot pie recipes and came up with this. We will never use another one..it’s so good! Just combine everything into a pie dish if you are not making the pigs. Chop up your celery and carrots. Put your chopped veggies, peas, and diced chicken in a large pot and cover with water. Bring to a boil for 15 minutes. Remove from heat and set aside. We used 4 (6oz) souffle dishes. Place the souffle dish on the crust and cut a circle with a inch or so beyond the dish.Place the bottom crust in the dish and press on the bottom and sides. There should be some of it sticking out around the top. 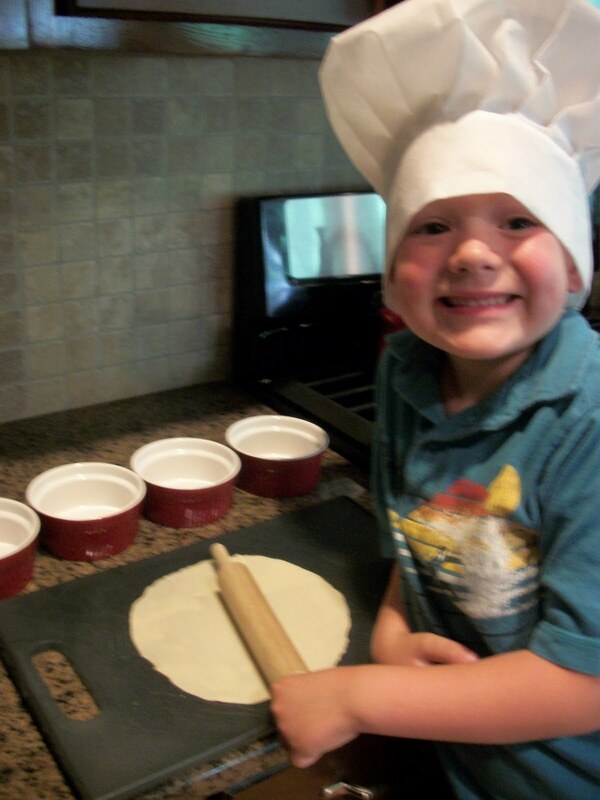 Roll out another pie crust to cut out ear shapes. We wanted our ears to curl so we took some pieces of aluminum foil and shaped it into small balls to lay our ears on. 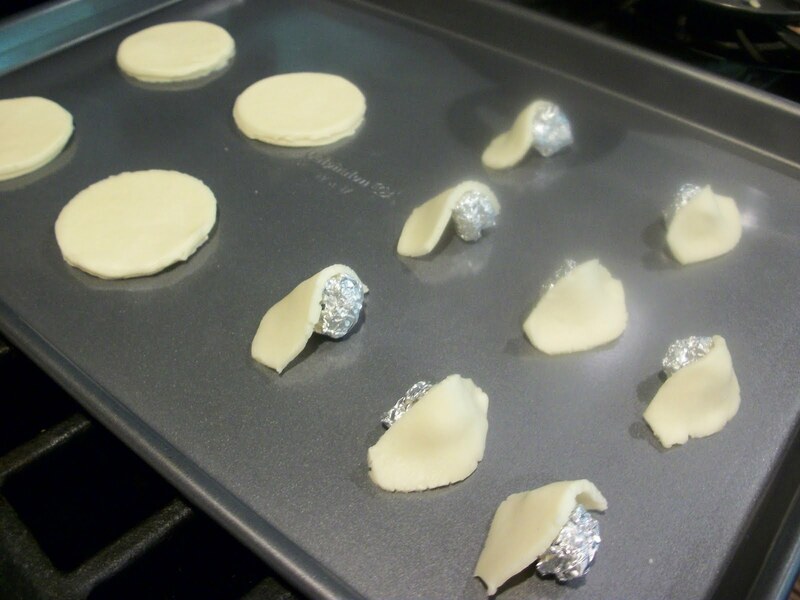 This made them shaped with a curve while baking as you can see in the picture. We cut out our pig noses with a glass that we measured on top of the dish. We put 2 holes in the noses and baked the noses and ears separately then set aside. In the saucepan over medium heat, cook onions in butter until soft. Stir in flour, salt, pepper, and celery seed. Slowly stir in chicken broth and milk. Simmer over medium-low heat until thick. Remove from heat and mix into the veggie mixture. 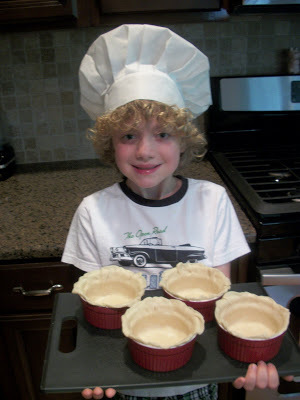 Place the chicken mixture in bottom pie crusts. Beat a egg white and brush the top edges of the souffle dish. This is to help the crust stick. 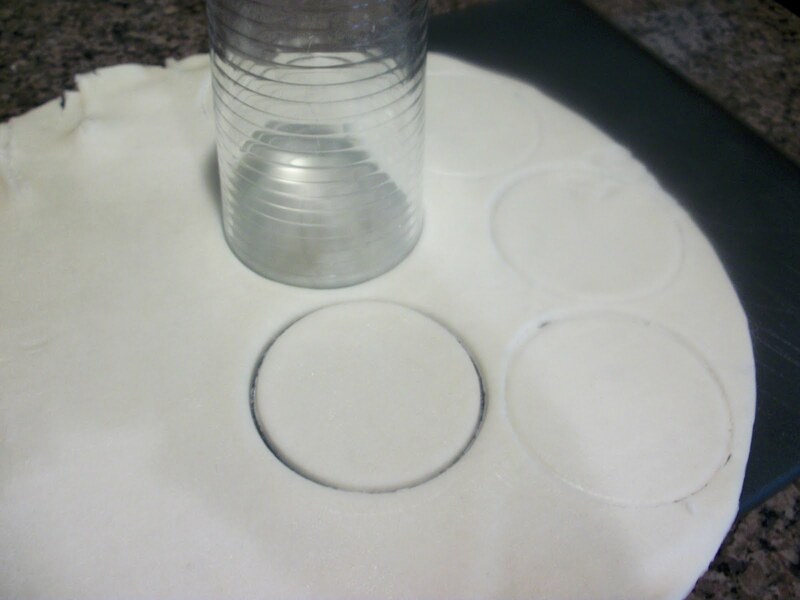 Cover with the top crust, seal edges, and cut away excess dough. Press down on the sides a bit to prevent any of the mixture from coming out. We made 4 holes in the top where the eyes would go and the nose to allow steam to escape. Brush the top with the egg wash.
Bake in the preheated oven for 25 to 30 minutes, or until pastry is golden brown and filling is bubbly. We used the hot mixture from the holes that we made on top as a glue to put on the ears. We put on the noses that we had set aside and 2 left over peas for the eyes. 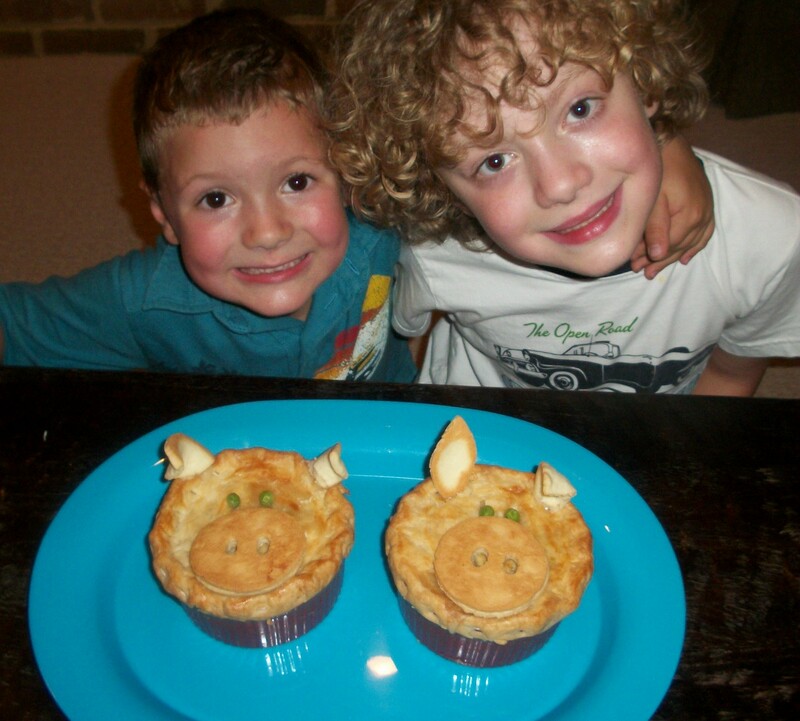 We had so much fun making these Piggy Pot Pies and we hope that you have fun making them as well! Next Post » Humpty Dumpty sat on a S’mores pop! you are the best mommy ever. such lucky boys you have! That is so sweet…thank you! o my goodness how darling! 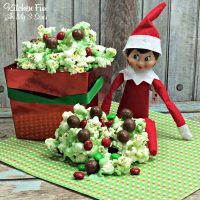 Awww these are so cute – too bad my boys are all grown up – guess the idea will have to wait for the grandkiddies! Thanks for sharing. I referenced you in my blog. Hope that's ok. 🙂 Love your blog. 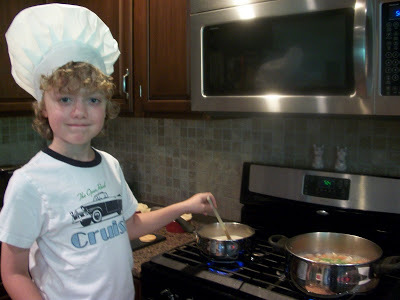 Funny I ran across this post because I just made chicken-pot pie last night (although it was WAY too hot here in NM to be cooking something like that)! These are adorable, I will have to remember your tutorial for next time! Oh I want to eat at your house, and I am supposed to be the cook in the family. 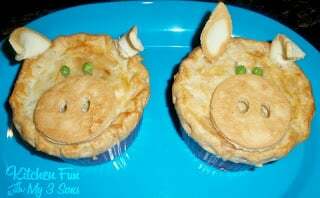 Love these, pot pies have always been one of my favorites and now that they look like little piggies well that makes me giddy. Thanks for linking to Bacon Time, hope to see you each week. Awesome! 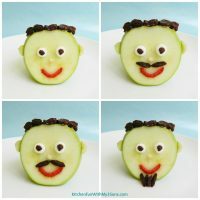 When I saw this linked up on Tatertots and Jello, I figured it had to be from your blog. Love all the neat things you do with your kids! Your little boys are seriously so cute!! 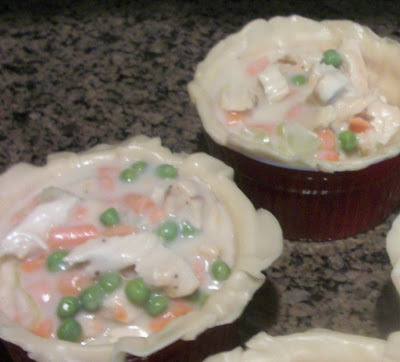 And these pot pies are darling. I think that my daughter might actually eat her dinner if I made these!!! We are your newest followers and we just wanted to thank you so much for linking up to our party! We would love to have you come back again tomorrow for Strut Your Stuff Saturday! These Are sooo cute! 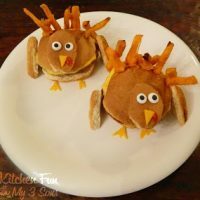 I wonder if making them this cute would get my kids to eat them! 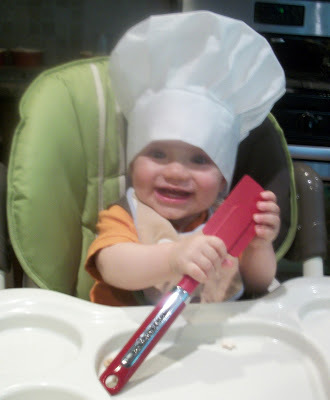 Hope you stop by thechickncoop.blogspot.com! So adorable!!! Love the picture of your littlest one in the chef hat!